Great marriages don’t happen by accident. The difference between a good marriage and a great one is commitment and hard work. 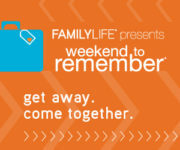 FamilyLife’s Weekend to Remember marriage getaway offers couples Biblical wisdom and a safe environment to work on their marriage, free from distractions. No spilling your guts to strangers, just the one-on-one focus you and your spouse (or future spouse) need to thrive, today and 10 years from today. If you would like to attend a Weekend To Remember Conference at a discounted rate, click here and use the group name: FBCArlington to register. The next conference is June 7th – 9th at Renaissance Dallas Plano at Legacy West.